Description: Z-CHCSSE gets three new DC Gevos and a Dash two this fine Sunday morning! Description: I think we've met before. Looks like someone forgot to add the rest of the S! 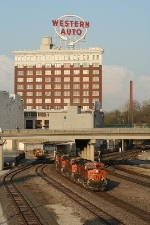 Description: After the train led by CSX 5440 cleared NS 191, lead by BNSF 7544 rolled down 6th Street. Its hard to find good foreign power in Augusta! Description: This one surprised me as I was heading out for lunch. Description: Leading the B FRSFRS. Description: Another eb stack train rolls under the old wooden bridge west of Gibbs on the BNSF transcon. 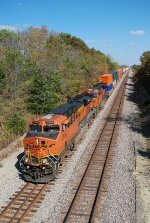 Description: Pair of DC Gevos splits the signals leading an intermodal for Memphis. Description: Cleghorn Road, 1502 hours.